Are you looking for a way to meet new people from all over the world, make new friends, and help others? The solution is simple and affordable—become a pen pal. 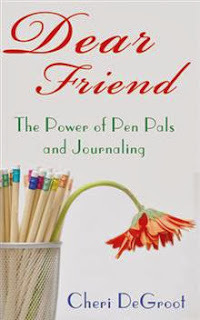 In Dear Friend, author Cheri DeGroot shares the joys and rewards of becoming a pen pal and provides tips on sharing friendships through handwritten letters. Based on fifty-three years of personal experience as a pen pal, DeGroot details how her lifelong passion for pen palling began and how her friendships with people from all over the United States have helped her through life’s good and bad times. This guide demonstrates the positive aspects of pen palling—from sharing news of family, hobbies and emotions to expanding their knowledge by learning about different cultures and different people. Stressing the importance of communication, Dear Friend reveals how becoming a pen pal can help those who are lonely to find friendship, love, and happiness through the power of the written word. Cheri DeGroot loves writing letters and journals of her life. Pen palling helps her make new friendships by reaching out through written letters and by computer. DeGroot has initiated several pen pal clubs. She has three grown children and seven grandchildren and lives in Milverton, Ontario, with her husband, Joe. Purchase a copy at iUniverse.